Join us for a Civic Dinners conversation exploring SMARTER mobility today and tomorrow. Miami-Dade TPO invites you to join leaders across Dade County in a conversation exploring SMARTER mobility today and tomorrow. The month of November the Miami-Dade TPO is hosting a series of Civic Dinners to discuss how to best increase transportation mobility options with residents and business leaders. Host or join a dinner exploring the current needs of public transportation users, the daily barriers to frequent ridership, and what it will require to develop and maintain a world-class transportation system. Gather 6-10 friends, peers, colleagues and neighbors for dinner for a conversation exploring SMARTER mobility today and tomorrow. Simply go civicdinners.com/Miami-DadeTPO-mobility click "Host a Dinner" and add your specific dinner details to create a custom dinner page to send to your guests to register for your dinner. All information regarding the conversation is automatically set, including email reminders and follow-ups sent to all guests and you as the host. Here are some things to keep in mind. Go to civicdinners.com/Miami-DadeTPO-mobility and click “Host a Dinner” to setup your dinner. YOU are amazing! Thank you for diving in and hosting a Transit Mobility Civic Dinner on behalf of Miami-Dade TPO! We've created copy/paste messaging to help recruit attendees at your dinner. I'm hosting a Civic Dinner on Transit Mobility on [insert date and time] at [awesome location of your Civic Dinner] and would love it if you could make it! This isn't just any dinner. This November, the Miami-Dade TPO is hosting Civic Dinners across the county to discuss how to best increase transportation mobility options with residents and business leaders. Host or join a dinner exploring the current needs of public transportation users, the daily barriers to frequent ridership, and what it will require to develop and maintain a world-class transportation system. You can anticipate some good food and good company, and some really meaningful and important conversation exploring SMARTER mobility today and tomorrow. To download these images and others click here. I'm hosting a Civic Dinner on behalf of Miami Dade TPO! Join me [date and time] for an important conversation exploring SMARTER mobility today and tomorrow. 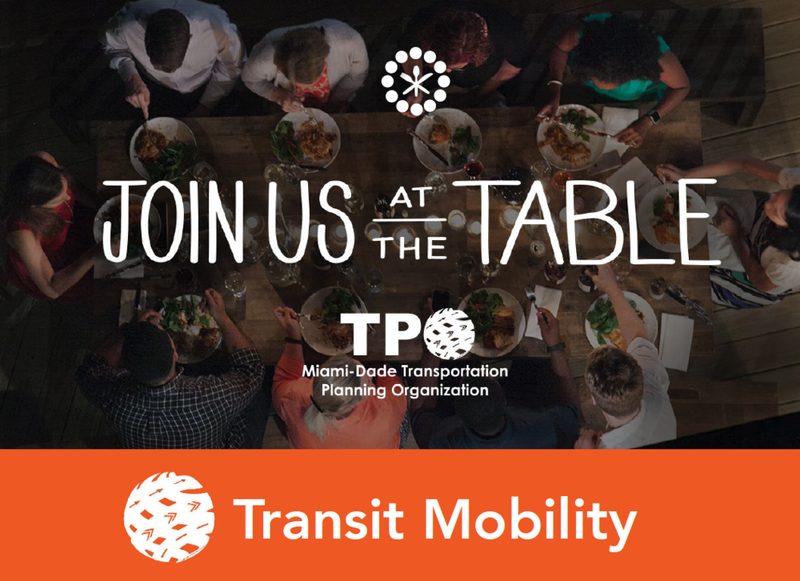 Miami-Dade TPO is looking for leaders across the Miami-Dade County to host a Civic Dinner on Transit Mobility. You'll join a movement of thousands of conversations exploring SMARTER mobility today and tomorrow. I'm hosting a Civic Dinner on Transit Mobility, one of many conversations across the Miami-Dade County! Join me [date and time] for a night of meaningful and important conversations exploring SMARTER mobility today and tomorrow..
Miami Dade TPO invites you to join leaders across Dade County in a conversation exploring SMARTER mobility today and tomorrow. This November, the Miami-Dade TPO is hosting a series of Civic Dinners to discuss how to best increase transportation mobility options with residents and business leaders. Join a dinner exploring the current needs of public transportation users, the daily barriers to frequent ridership, and what it will require to develop and maintain a world-class transportation system. You’re invited to join communities across Miami-Dade County in a conversation exploring SMARTER mobility today and tomorrow. This November, Miami-Dade TPO is hosting Civic Dinners across the county to discuss how to best increase transportation mobility options with residents and business leaders. Host or join a dinner exploring the current needs of public transportation users, the daily barriers to frequent ridership, and what it will require to develop and maintain a world-class transportation system. We are proud to partner with Miami-Dade TPO for this important conversation and see it as a great way to engage our local partners, families and community leaders. You’re invited to join communities across Miami-Dade County in a conversation exploring SMARTER mobility today and tomorrow.. This November, the Miami-Dade TPO is hosting a series Civic Dinners to discuss how to best increase transportation mobility options with residents and business leaders. Host or join a dinner exploring the current needs of public transportation users, the daily barriers to frequent ridership, and what it will require to develop and maintain a world-class transportation system. Learn more and find all the helpful tools and resources about how to host and spread the word, here. BE OUR GUEST! Join us at the table for a @civicdinners conversation around #MiamiDadeTPOcivicdinners #MiamiSMARTPLAN in your community to explore SMARTER mobility today and tomorrow.